Sign up now by clicking on the image! The results of the 2017 Spring Club Contest are in…..
Last night was contest night! It was an exciting evening with a full house and 6 speech contestants as well as 4 evaluation contestants. 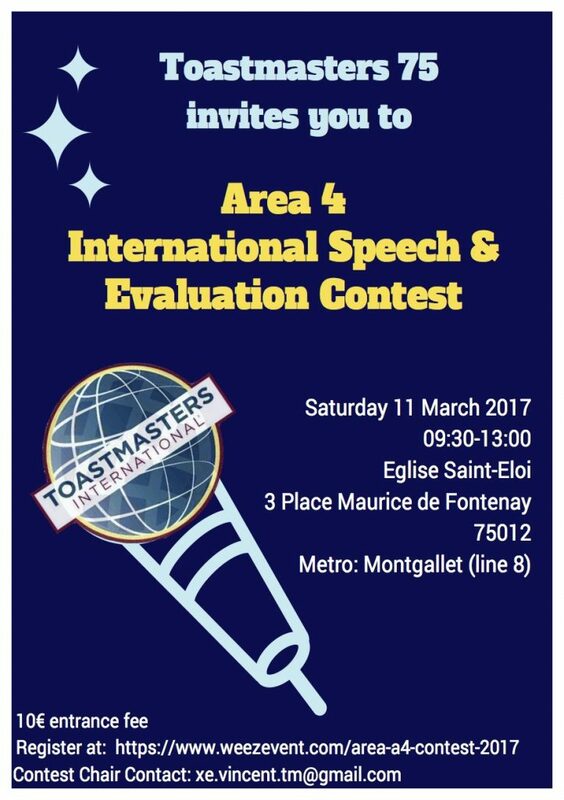 The 1st and 2nd prize winners in both competitions have agreed to represent La Défense Toastmasters at the Area 4 Contest in Paris on Saturday morning, 11 March. The Club Fall Contest is approaching! Will you go to Madrid? At the end of September – on Thursday 29, to be precise – our Fall club contest will once again take place. All members can be a contestant in either the Humorous Speech contest, and/or the Table Topics contest. Or, help organize in a variety of roles. The winner will go on to the area contest, and if you win that, the division contest. If you win that contest as well, you can represent us at the South & Western European (District 59) Conference in Madrid! Our club now has a Facebook page! Visit it, like it, post your pictures, comments and anecdotes on it! Watch out! La Defense Toastmasters Spring Contest 2016 is coming up! Speech contests are a tradition at Toastmasters. 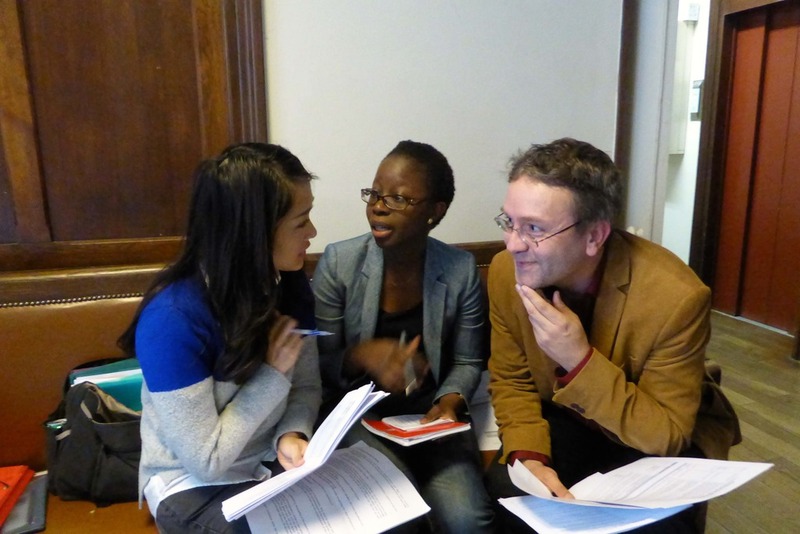 Each spring, a series of Evaluation and International Speech contests is organised, followed by a series of Table Topics and Humorous Speech contests each fall. Competition begins with club contests, with the winners continuing on to compete through the area, division and district levels. The International Speech competition goes two levels further: semifinals and then the World Championship of Public Speaking. In an evaluation contest, one single speaker (the “target speaker”) delivers one regular five-to seven-minute speech. The contestants then leave the room and have five minutes to prepare a 2-3 minutes spoken evaluation of the speech, alone, in silence. They then come back one at a time to present their evaluation, while the remaining contestants are kept in a place where they can neither hear nor see the stage. In the International Speech contest, each contestant presents a 5-7 minute speech on any subject they choose. It is called “international” because this particular contest is the only one (out of the four types of contest we have) to go all the way to the level of World Championship. Contest Chair – This spring in our club, the contest chair is both the coordinator and presenter (“Emcee” or “Contest Master”) of the contests. Sergeant at Arms – The responsible for the venue setup, logistics, refreshments, registration, and accompaniment of evaluators between the Target Speech and the delivery of their evaluations. Target Speaker – The person who delivers a speech for the evaluators to give feedback on. This is an exceptional opportunity get excellent feedback from not one but a host of evaluators, all on top of their game! Ballot Counter – A minimum of two ballot counters count the ballots and they conform to the contest rules. Timer – A minimum of two timers keep track of the timing of the speeches and evaluations. They are each other’s backup, in case one of them cannot pay full attention for whatever reason. Chief Judge – The guarantor that all applicable rules are observed. This person recruits, coordinates and oversees the teams of judges, ballot counters and timers. Tie-Breaking Judge – This judge does a job similar to the other judges. However, his/her ballot will not be used except in case of a tie. Only the Chief Judge knows the identity of the Tie-breaking judge. In order to participate in any role at a club contest, the only requirements is to be “a member in good standing”. That is, the person must have paid the membership fee for the period in which the contest is taking place. The contest season does not end at the club level! The winners of first and second place of each contest will represent our club at the Area A4 contest that will be held in Paris on 26 March 2016. This is one of the two English-speaking areas in Northern France. The winners of the Area A4 contest will represent our area at the Division A Conference in Paris on 16 April 2016. More information here: www.toastmastersdivisiona.com. 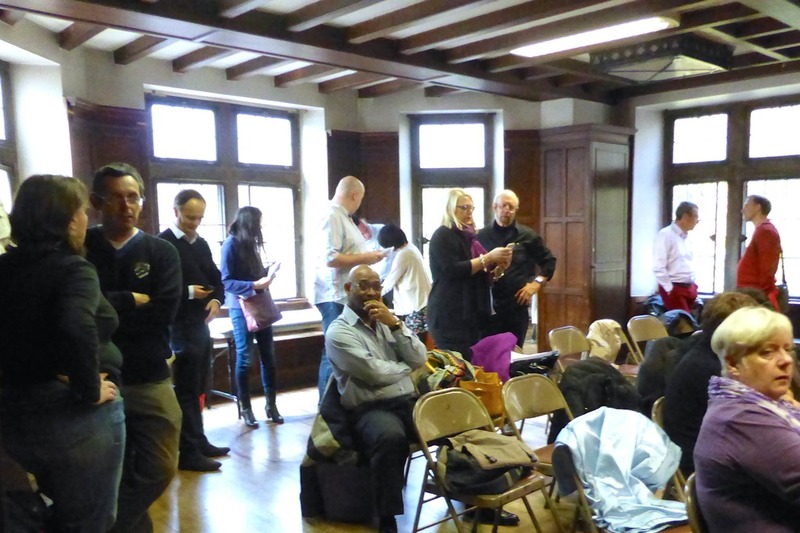 Here you will meet Toastmasters from clubs in Northern France, regardless of the language of the clubs. The winners of the Division A Conference will represent our Division at the District 59 Conference on 20-22 April in Luxembourg. More information here : www.luxembourgtalks.org. At this Conference you will meet Toastmasters from throughout District 59, currently consisting of: France, the Netherlands, Belgium, Luxembourg, Spain, Portugal, Switzerland and Italy. For the Evaluation Contest, that is the last stage. For the International Speech contest, however, the winners will go on to the Semi-Finals, and hopefully to the World Championship of Public Speaking, from 17 through 20 August 2016, in Washington D.C., USA. Area Contest down! Next up, 2015 Division A District 59 Contest! We are happy to announce the winners of the Area 4 Contest Oct 17th, 2015 below! Thank you for coming out to enjoy such a great afternoon with us. We hope that you will continue supporting our contestants in the next round of the contest! Humorous Speech and Table Topics Division Contest! Come join us to enjoy an event full of laughter, listening to the best and funniest toastmasters in the division! This is a great opportunity to mix and mingle with the other Toastmasters members. You will also enjoy a bilingual workshop on Improvisation, Creativity, and Laughter! What better to improve your public speaking than by observing those who already excel in it? Our ‘Get Inspired’ series will look at different people who have delivered incredible speeches and see what made them engage with the audience. 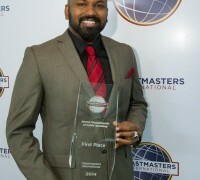 In the first of this series is Dananjaya Hettiarachchi from Sri Lanka who won the 2014 Toastmasters World Championship of Public Speaking. His speech, entitled ‘I see something’ encompasses all the elements of an excellent speech with elements of surprise, inspiration and humour. These are the two things I found exquisitely done in Dananjaya’s speech. Dananjaya used the fool-proof technique of repetition very well and not only weaved it cleverly in his speech but he used his title to turn it into a catchphrase. Combined with carefully timed pauses, the impact of each time he said the catchphrase, created a real connection with his audience – the evidence is in their rapturous laughter. This is what I found made his speech so powerful and egaging. We know body language is important to delivering a good speech (no surprise that it’s part of Toastmaster’s Competent Communicator program) and Dananjaya’s gestures and movements are done with deliberation to add drama and visual emphasis to his words. Watch how his actions when he talks about his mother crying and how the emotions you felt when he described this. Watch the video yourself and see how many best practices you can learn from his storytelling techniques. What did you found inspiring in Dananjaya’s speech? Let me know in the comments below. La Defense Toastmasters Club sent three participants to the Area Contest on October 18 and we are immensely proud that one of our participants came in the top three for the Humour Speech! Kayee will go on to represent the club at the District Conference on 15th November. We caught up with our winner Kayee after the contest. Many congratulations on winning 2nd place! How does it feel to come in 2nd place? Thank you! I couldn’t believe it because the level of other contestants was really high. When I first prepared my speech, I thought it contained more body movement than really speaking so wasn’t sure it could really count as a “speech.” However I really loved the topic and so decided to have great fun preparing and delivering it without thinking about getting any award. I simply enjoyed every millisecond of the speech! 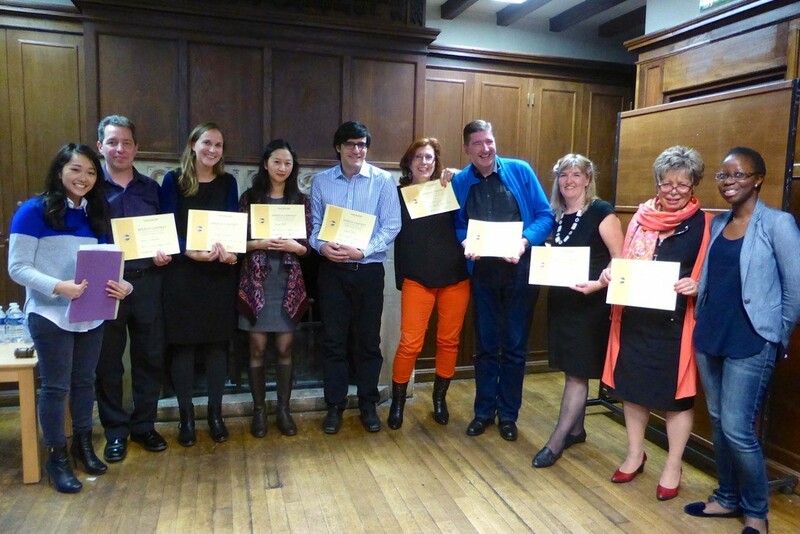 I am really happy and grateful for what La Défense Toastmaster Club has given me! What was your speech about and what was its key messages? What inspired you to do this speech? I wanted to entertain people and make them laugh! When did you become a member of Toastmasters and what made you decide to join? I joined early 2014. I was working in La Défense and as I am a really active person who loves meeting people and doing fun things whilst improving myself. 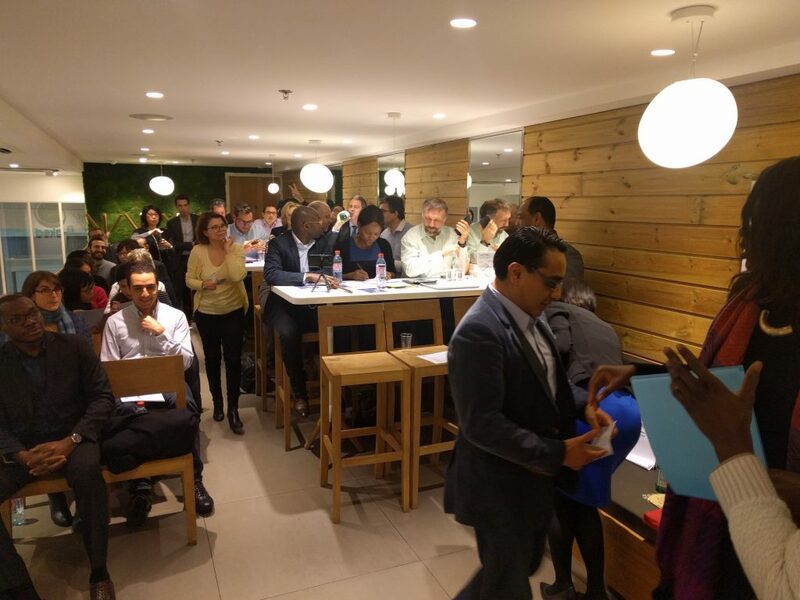 I saw the La Defense Toastmasters group on Meetup.com and went there as a guest. I had such an awesome evening that I decided to become a member! How has coming to Toastmasters helped you? It has helped me by giving me back my self-confidence. I used to be very active in theatre acting during my teenage years and up to about 5 years ago. 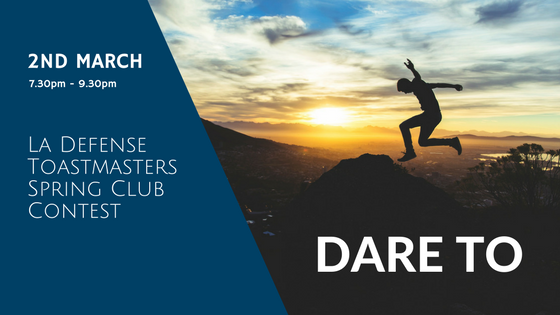 I was not sure whether I would be able to have the same level of confidence again, but Toastmasters has proven that it is possible thanks to the support and feedback from our club members. Would you recommend Toastmasters to others and why? Certainly! For me, participating in the Humour Contest was simply this: right before that precise moment I told myself, “I don’t care how I will be judged. It’s not about winning but having fun, being myself and talking about what I value.” I am proud to be recognised for my speech. Everyone should give themselves the chance to find out what public speaking means for them because you never know just how far you can go!